Final construction on the multi-year project was completed in Sept 2017. 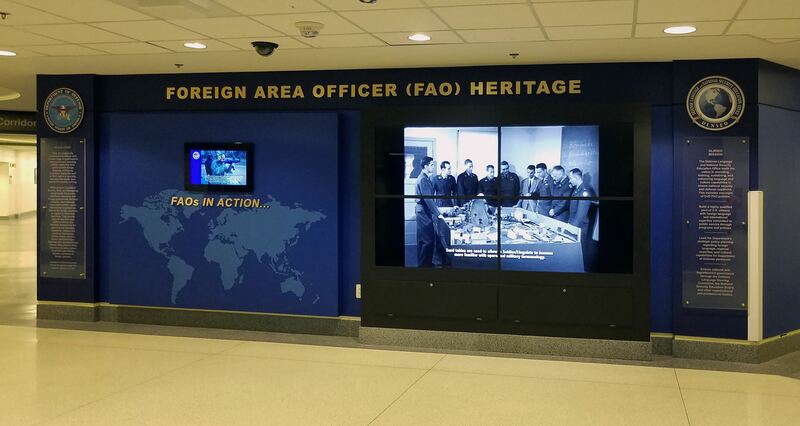 The FAO Heritage Pentagon Exhibit located in the 7/8 APEX, 2nd Floor is fully complete with a groundbreaking that was hosted by Mr. Daniel P.C. Feehan, Principal Deputy Assistant Secretary of Defense (Readiness), Performing Duties of the Assistant Secretary of Defense (Readiness) on December 12, 2016. For more details please click here. 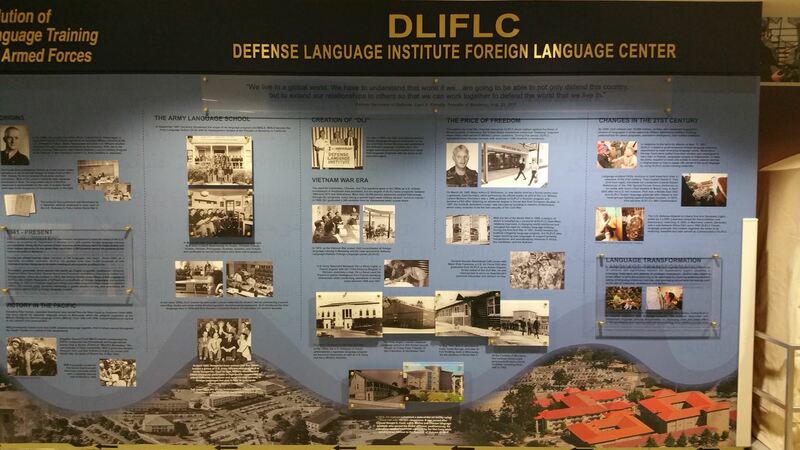 From left, Lee Johnson, Navy senior language authority and Director of the Navy Language, Regional Expertise and Culture Office; Diana Banks, Deputy Assistant Secretary of Defense for Force Education and Training and the Defense Department’s senior language authority; Daniel P.C. 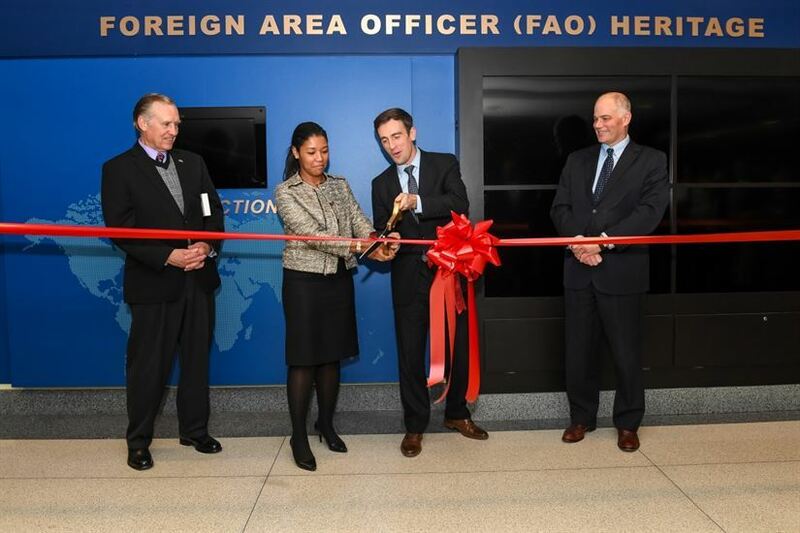 Feehan, Principal Deputy Assistant Secretary of Defense for Readiness; and Michael Nugent, Director of the Defense Language and National Education Office, cut the ribbon to dedicate the foreign area officer heritage wall display at the Pentagon, Dec. 12, 2016. 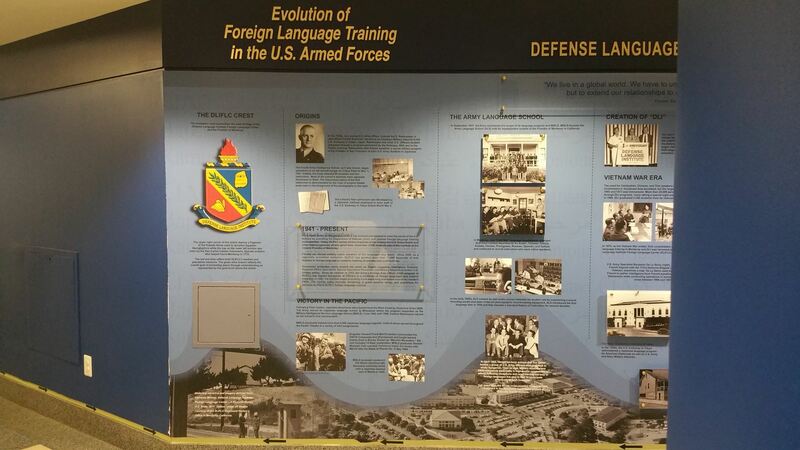 DoD photo. FULL REPORT (will be updated/replaced with FAO Journal Article in Sept/Oct 2017). 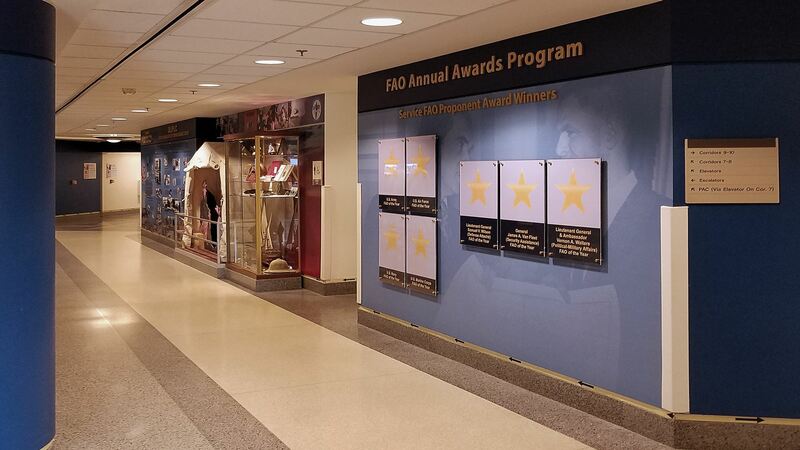 Alongside the display, a formal process has been created (DRAFT) to establish a FAOA Charter endorsed, "FAO Hall of Fame/Annual Awards Program." 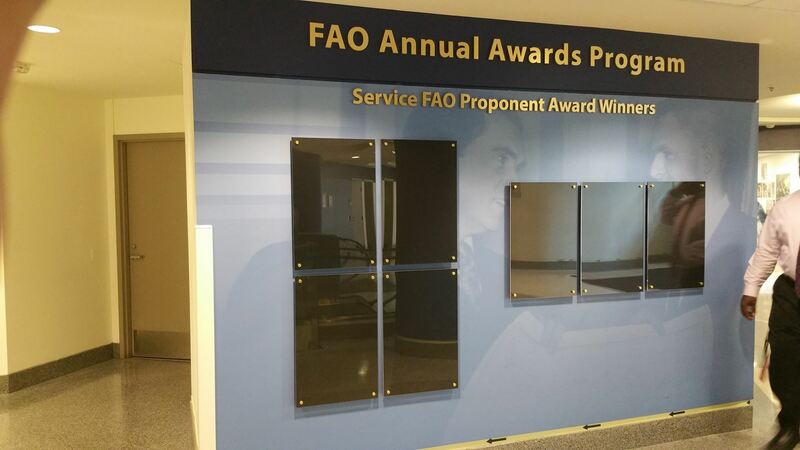 Below are photos of the FAO Annual Awards Program and other portions of the completed Exhibit including Video Wall. 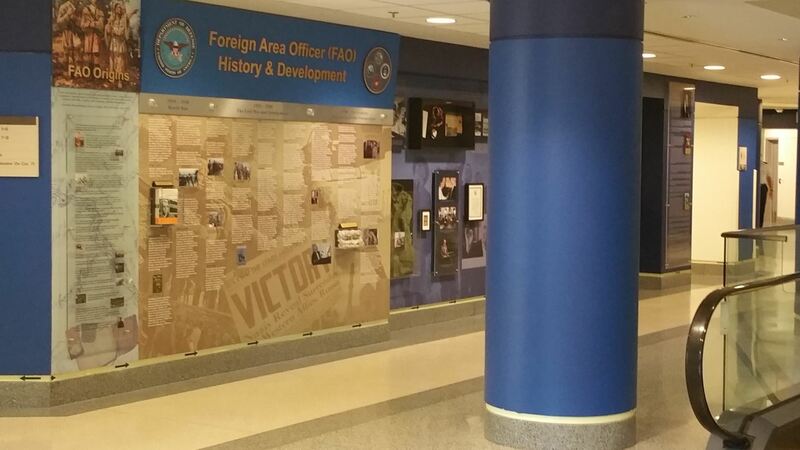 Phase 1 is complete and can be viewed in Pentagon (7/8 APEX, 2nd Floor). Please scroll down for Phase 2 update. 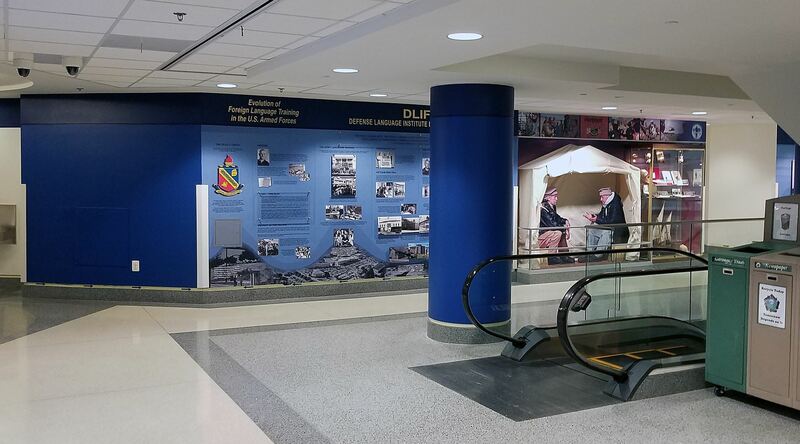 For Phase 2, there are still plenty of opportunities to share ideas for design and content of the alternative wall including a need for additional artifacts especially those that may have been acquired during recent tours in Afghanistan and Iraq. Front Wall/Right side (Video Wall) will include four 45” flat screens with the capability to display a timed loop of photographs and selected video. 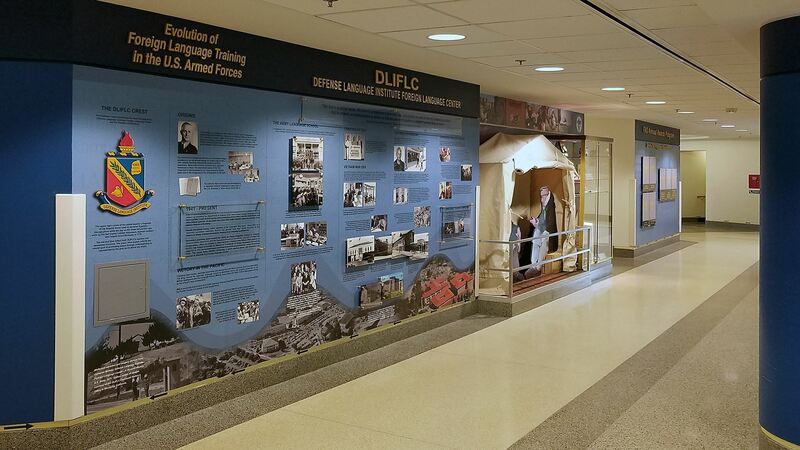 Wall 3 (above) will include a historical narrative of the FAOs prime capability, foreign language including content and an evolutionary overview of the Defense Language Institute Foreign Language Center (DLIFLC); an artifacts section; and FAO Annual Awards Program display (which is still under development for review and approval). 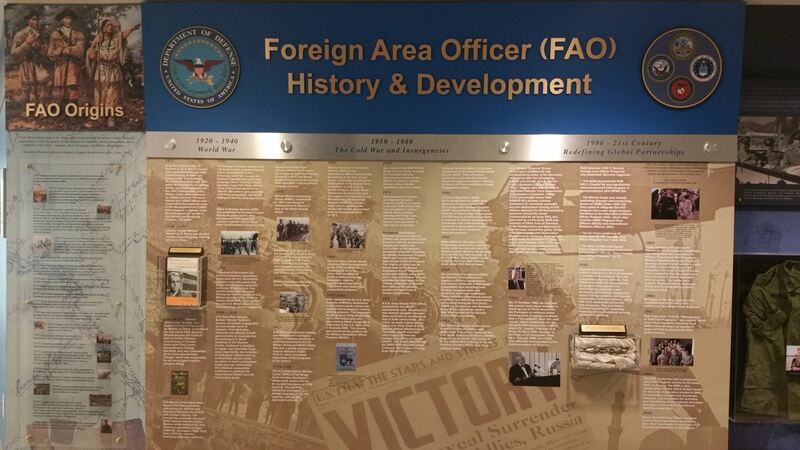 On 3 September 2013, Mr. Al Jones, the Curator for the Office of the Secretary of Defense Historical Exhibits sent forward specifications and guidance to The Saenz Group, the vendor who will begin construction of the FAO exhibit due for completion by the end of October 2013. 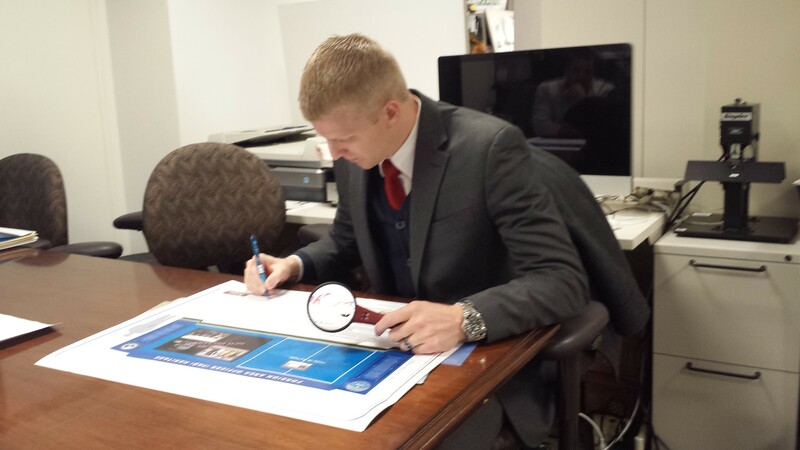 This will finalize Phase I (FY13) portion of the project. See details below for Design and Construction schedule. 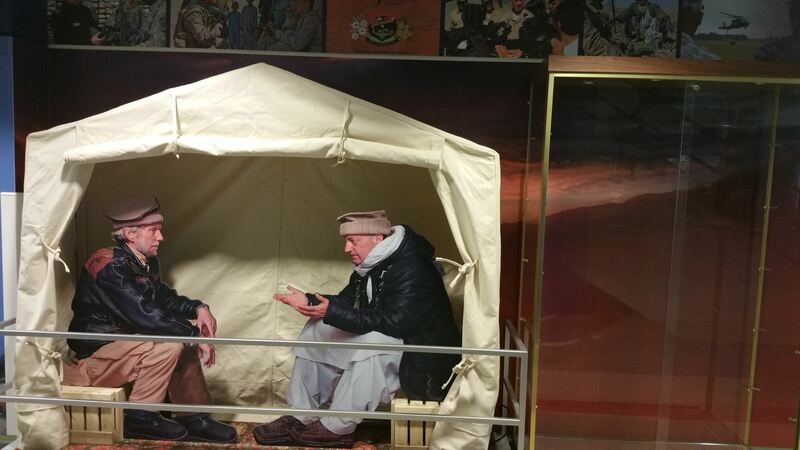 Pictured above (left to right), Mr. Al Jones and Mr. David Edwards (DLNSEO) signing off on final production proofs on December 2013.
substantial review of the exhibit. 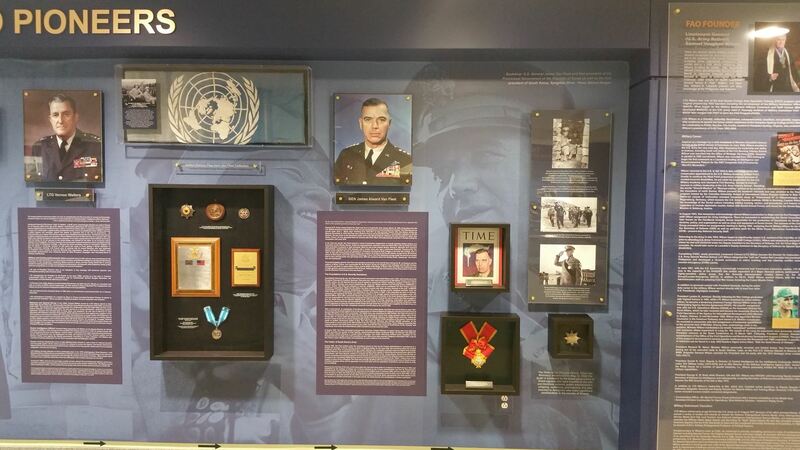 Additional appreciation must also be relayed to the FAO Journal Edit team, Service Historian offices, Dr. Roy McCullough and all of the artifacts he provided to support Lieutenant General Vernon Walters, LTC Jason Weece, Defense Language Institute Foreign Language Center Program Manager, and FAO Heritage Exhibit Design Committee Chair, Ji Shin. 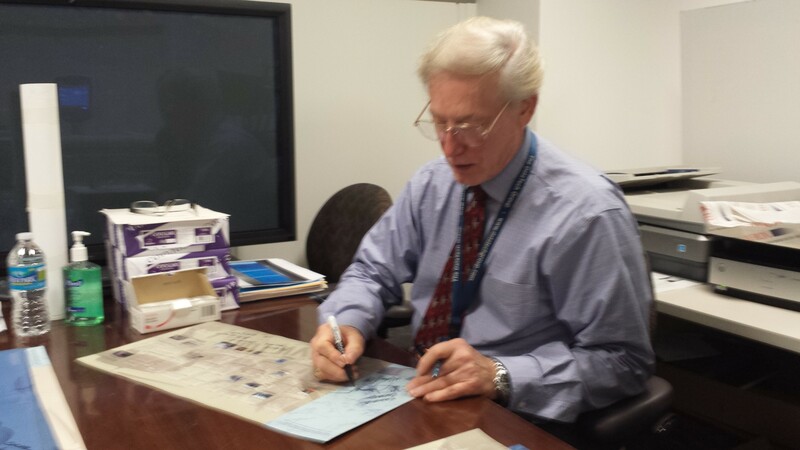 We are also especially thankful for personal comments and insight provided by (U.S. Army retired) LTG Sam Wilson, one of the first Russia FAST graduates. 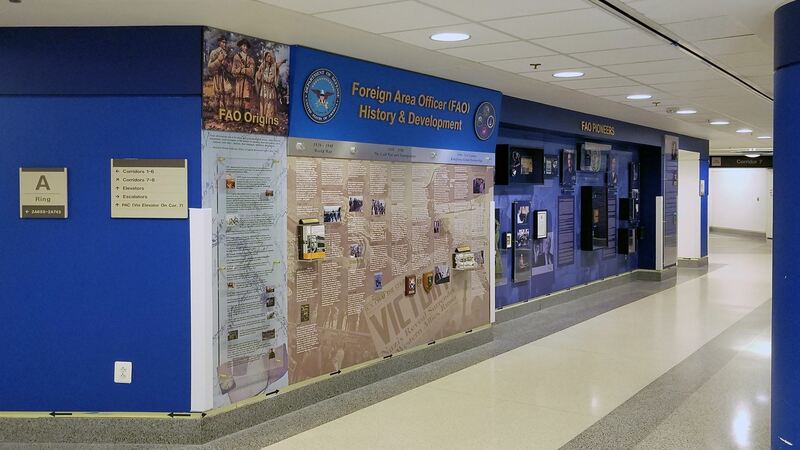 PHASE I (FY13): Consists of two walls. Due for completion by the end of October 2013. 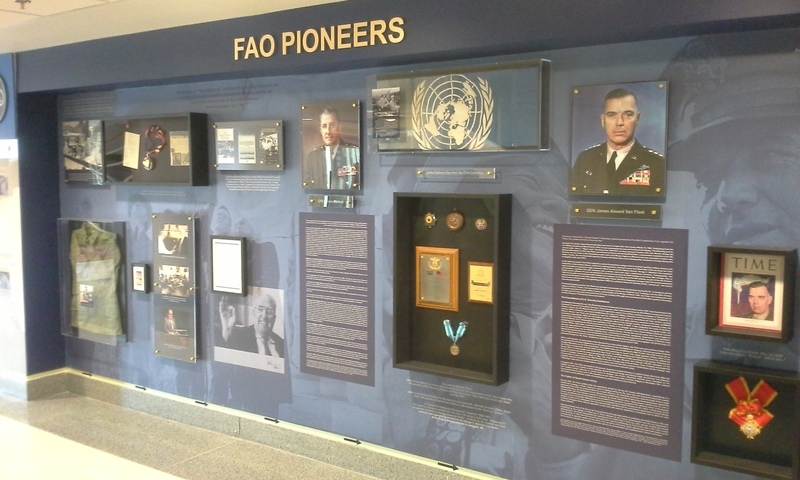 Wall 1 (pictured above) includes FAO Origins dating back to the expeditions of Lewis and Clark; FAO History and Development (starting in 1930 to a 21st Century theme titled, Redefining Global Partnerships); a section displaying the accomplishments of two FAO Pioneers, Lieutenant General Vernon Walters and General James Van Fleet; and a dedication to a FAO Founder, (U.S. Army Ret.) Lieutenant General Samuel Vaughan Wilson. 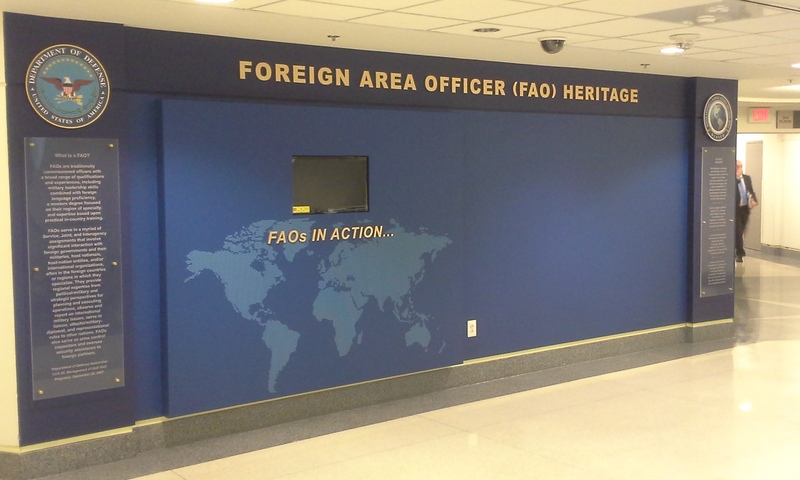 Wall 2 (pictured below) is the primary front portion of the exhibit, which includes a definition of “What is a FAO?” in addition to an overview of DLNSEO as the lead sponsor of the exhibit. 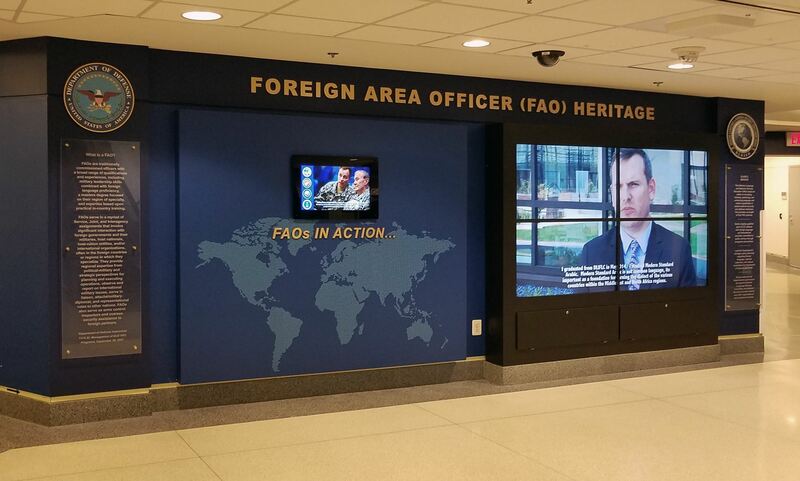 Wall 2 also includes a touch-screen internet kiosk, which will allow the display of multiple FAOs in Action categories of information like a FAO Hall of Fame and Roll of Honor.